Wailuku is a mix of high brow and low brow, upscale and shabby, civic and rural, quirky and dignified, gritty and lush. A bird's eye view of Wailuku from the tallest building in town. Located in Central Maui, Wailuku is Maui’s idea of “urban”: a few tall buildings - perhaps the tallest buildings in the county, a few government buildings, an industrial + commercial district, and a pedestrian-friendly downtown which give way to old plantation style houses and storefronts, disgruntled sidewalks, windswept sugar cane fields, the lush green of Iao Valley, family beach parks, and clandestine nature preserves. As the county seat of government, Wailuku is the center of political intrigues and contested debates that affect all of Maui County, which includes not just the island of Maui, but also Lanai and Molokai. Sometimes activists will swarm Wailuku holding signs to ask for water meters (after being on a waiting list for 20 years), protest sugar cane burning, or celebrate signature gathering for petitions to change county laws. I especially like the Maui Time art on the newspaper stand. This is an alternative, popular weekly paper, based in Wailuku. Many of us who enjoy the renewed vibrancy of Wailuku town with its Fourth Friday Town Parties, shows at historic Iao Theater, and new wave of businesses, shake our heads and mutter when we think of the slow processes of the County, especially if we are applying for building permits, liquor licenses, or water meters. 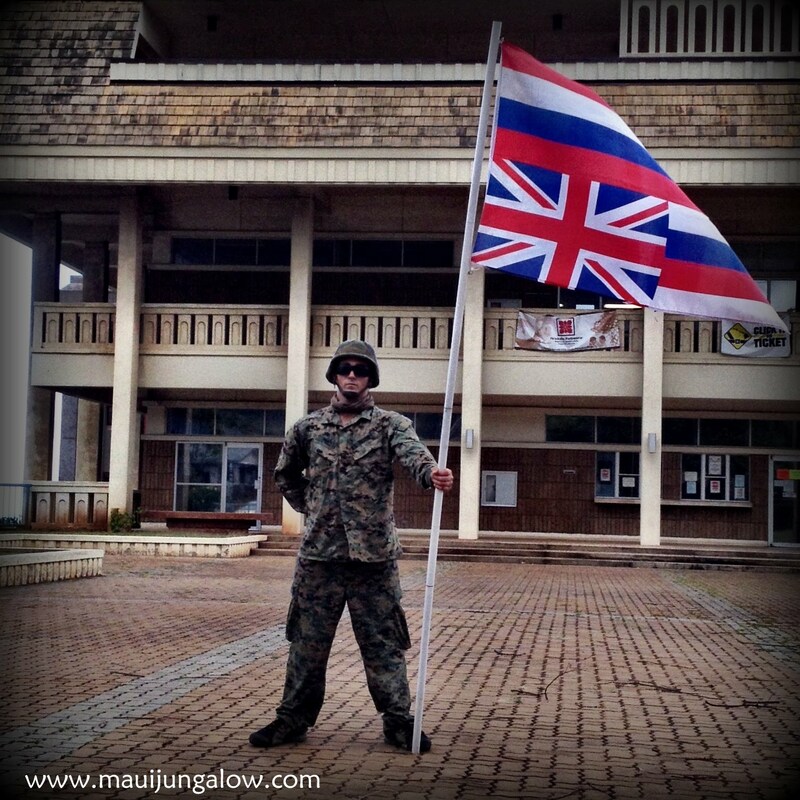 Hawaiian sovereignty activist protesting in downtown Wailuku. This process can be so arduous and time consuming that some people hire others to present their requests and paperwork to the right channels, in the hopes of an expedited response. Sometimes it works. Other times, while waiting for approval, businesses shut down, land is stuck in escrow purgatory, and people’s hair turns white. Wailuku exercises a subtle charm that grows with repeated exposure. It’s like a favorite old t-shirt that is getting worn out but is too comfortable to throw away. Even old termite-eaten shacks and rusty roofs have an aesthetic, wabi sabi appeal. Wailuku is pronounced "Why - loo-koo" Loo and koo are like the koo in Kool-aid. 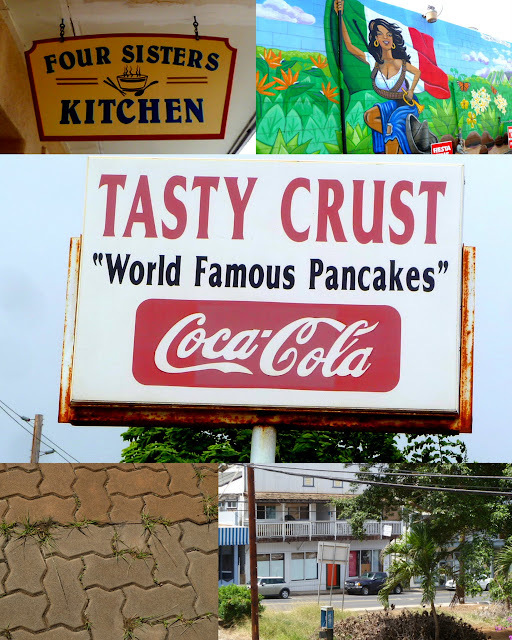 One feels part of old Maui here, driving down one-way streets and narrow alleys, eating at local nooks like Tasty Crust known for their hotcakes, Sam Satos for their dry mein and saimin (aka ramen noodles), Takamiya’s, a small mom and pop grocery store in a neighborhood called Happy Valley, which is not always happy to have visitors…, TJ's Market, Home Maid Bakery... the list of local eating spots goes on. Tasty Crust and Four Sisters Kitchen are popular places to eat in Wailuku. Maui history hides in mundane metered parking lots, patrolled by infamous Officer Taguma who once gave a ticket to his mother. 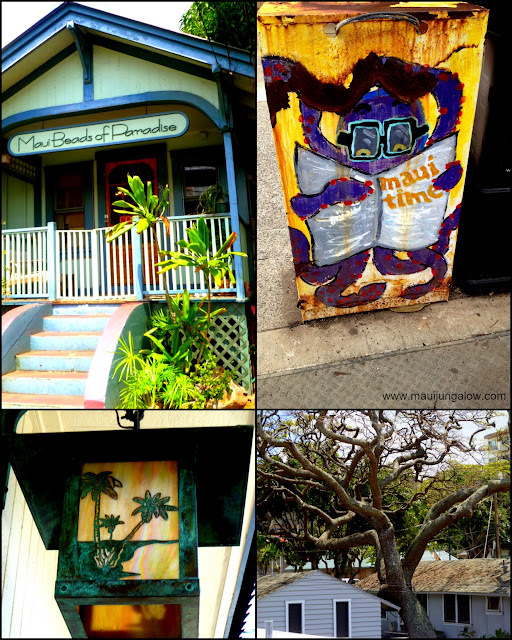 The Bailey House Museum, just up the street from the government buildings, is steeped in more Maui history and culture. But when it gets too gritty, there is always escape to beautiful, mysterious Iao Valley or to the Waihee Coastal Dunes. If you are participating in the A to Z Challenge, please use either Disqus or Facebook to comment below. Please include your link so that I can visit you back, but it might be as late as May! Three letters left!